Fewer Than One in Three Young Americans Can Join Military. The wars in Afghanistan and Iraq have ended, and Congress has ordered the military to reduce troop levels. 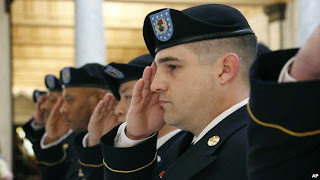 But the United States Army -- and other military services -- must continue to recruit new soldiers, and it is having trouble finding enough people who are qualified. The U.S. Army plans to reduce its size from 508,000soldiers to 450,000 by the year 2017. 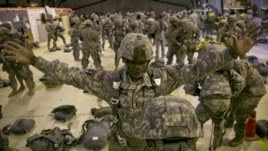 Most new soldiers leave the service after their first enlistment period of three or four years has ended. So the Army must still recruit between 70,000 and 90,000 young Americans every year to reach its target troop level. People who want to join the Army must be in good physical and mental condition. They must be between the ages of 17 and 34. They must have graduated from high school. They must not have used illegal drugs or have a criminal record. And they may have only small tattoos -- and none on their hands, face, neck or head. The Department of Defense says 71 percent of young Americans between the ages of 17 and 24 would not be accepted into one of the nation’s military services if they volunteered. The Army believes that number will increase to 80 percent by 2020, mostly because of the expected rise in obesity levels. The Army says about 28 percent of people who apply are rejected because they are overweight or have behavior problems. Others are not permitted to join because they have a criminal record or a history of drug abuse. Some are rejected because they are unable to meet the military’s academic requirements. One-quarter of the high school graduates who take the Army’s math and reading test fail it. U.S soldiers participate in a NATO exercise in Kosovo. Beth Asch is a senior economist at the RAND Corporation, a research group. She studies military recruiting activities. She is surprised by the number of people who cannot meet the military’s standards. Major General Allen Batschelet is the commander of the U.S. Army’s Recruiting Command. He spoke to the public radio program Here and Now in August about the Army’s recruiting difficulties. He says the main problem is young Americans’ poor physical fitness. In the 2010 National Health and Nutrition Examination Survey, the National Institutes of Health found that one-third of all Americans can be considered obese. A group of retired senior military officers is warning that the country’s high obesity rate threatens national security and the military’s ability to win wars. D. Allen Youngman is a member of the group, which is called Mission: Readiness. He is a retired U.S. Army major general. He told VOA the problems of American society are affecting the country’s military. The retired senior officers are fighting larger social forces. For instance, schools do not always offer healthy food or require that students exercise. General Youngman says he knows changing people’s behavior is a difficult fight. The U.S. Army reflects the nature of the country’s youth. And many young Americans are simply too fat to fight. General Batschelet says he is worried the Army will soon be unable to reach its recruiting goals. He says the country’s current social trends may be creating a serious national security problem. Tomorrow, we will report on possible changes to the Army’s weight standards or cyber-warriors. Not everyone is happy the Army is considering such a change. Christopher Cruise reported and wrote this story for VOA Learning English. Hai Do was the editor.